NEW YORK, February 6. /TASS/. The family of US national Paul Whelan detained in Russia are circulating a draft bill to the US Congress to "attempt to close the Privacy Act waiver loophole," Paul Whelan's brother David told TASS in an email. "The US Embassy staff visited with Paul yesterday (2/5), their second visit since he was arrested 40 days ago. Due to prison regulations, they were unable to give him a Russian-English dictionary and he was not allowed to sign a Power of Attorney. The Russian investigator has finally allowed Paul to see the Privacy Act Waiver but he wasn't allowed to sign and give it to US Embassy staff during the visit. Instead, Paul will have to mail the signed form to the Embassy," David Whelan said. "We are circulating a draft bill to Congressional representatives to attempt to close the Privacy Act waiver loophole. If passed, it would allow Americans detained by foreign governments to provide an oral waiver of the Privacy Act in situations where they aren't allowed, or aren't able, to sign a release as the law currently requires. While Embassy staff can utilize exceptions in the Privacy Act to communicate with Congress, a foreign government shouldn't be able to interfere with a detained American's right by blocking the ability to sign a release. Hopefully, the House and the Senate can take this action before the next American is detained," he continued. "At the least, an American would expect the US government to be able to ask for, and receive, information from the Russian government that explained the allegations against an American citizen. If governments won't act without information, which they seem unable to acquire, it leaves Americans traveling to nations like Russian in a precarious position. We hope to see government action to bring Paul back to his family," Paul Whelan's brother concluded. 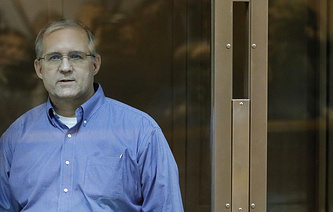 According to Russia’s Federal Security Service (FSB), Paul Whelan was detained in Moscow on December 28, 2018, while on a spy mission. The FSB Investigative Department opened an investigation under Article 276 of the Russian Criminal Code (espionage), which carries a punishment of ten to 20 years in prison. Whelan, 48, is corporate security director for automotive parts supplier BorgWarner. According to the Washington Post, he enlisted in the US Marines in 1994 and "rose through the ranks to become a staff sergeant, serving two tours in Iraq, in 2004 and 2006." However, Whelan "was discharged for bad conduct in 2008 after being convicted of several charges related to larceny." Paul Whelan holds citizenship of the US, UK, Ireland and Canada.